ROCKVILLE, Md., Nov. 15, 2017 — Overlooking the Pacific Ocean, The Volaré in San Clemente, Orange County, Calif. has joined the Ascend Hotel Collection global portfolio of best-in-class independent upscale hotels and resorts from Choice Hotels. 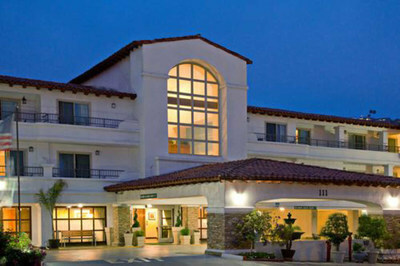 The Volaré is a 73-room property positioned in the heart of San Clemente, a charming beach community. Located at 111 S. Avenida De La Estrella, The Volaré hotel is within walking distance to several shops, restaurants, and popular destinations, such as Trestles Beach, the San Clemente Pier, and Dana Point Harbor. Marine Corps Base Camp Pendleton is just minutes south of The Volaré. The hotel features a speakeasy-style lounge called “Through the Looking Glass,” where guests can take a step back in time and relax to live music while enjoying limited edition whiskeys, a large wine selection and seasonal IPAs. The hotel offers a range of lodging options, including suites with kitchenettes and in-room hot tubs, as well as standard rooms with wrap-around balconies and sweeping views of the ocean. Guests can enjoy complimentary hot breakfast buffet, an outdoor pool, fitness center, trolley rides to the beach, and laundry facilities. Dedicated to protecting the environment, The Volaré property utilizes sustainable materials and renewable resources without compromising modern conveniences and upscale sophistication for guests. The hotel also strives to reduce waste by donating excess shampoo, conditioner and soaps to non-profit organizations that redistribute these items to developing countries. The property is also currently working toward LEED certification, the most widely used green building rating system in the world. Known for inspiring individuality, the Ascend Hotel Collection is the first and largest global soft brand, featuring best in class unique, boutique and historic hotels and resorts with more than 190 properties worldwide. Ascend Hotel Collection properties can be found in popular destinations around the United States, as well as in France, United Kingdom, Norway, Sweden, Turkey, Australia, and Canada. As part of the Ascend Hotel Collection, The Volaré hotel participates in the award-winning Choice Privileges loyalty rewards program, rated no. 1 in USAToday‘s 10Best Readers’ Choice Awards list. Membership is free, offers fast rewards, instant perks, and exclusive member rates when booking directly at www.choicehotels.com. Members can redeem points towards free nights, airline miles and more while staying at any of Choice’s global hotel properties.